I’ve previously looked at one of the most liked (and according the to the Wirecutter the best) recent mechanical pencils, the UniBall Kuru Toga; I was under whelmed. Recently I was able to get a hold of the upgraded version, the Roulette. Is it worth the upgrade? Should you skip the regular model and get this one? Let’s take a look. 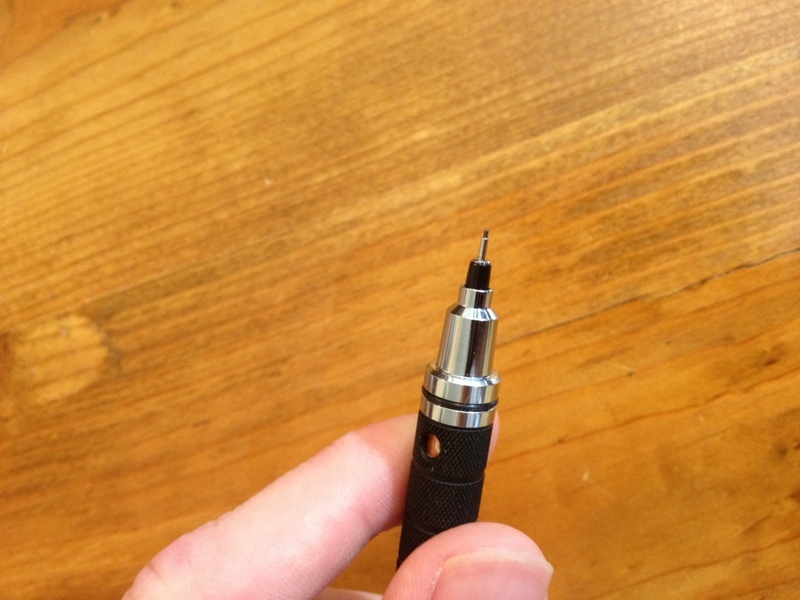 The back end of the pencil is a plastic and metal lead advancer; it works and doesn’t dig into the skin. There is a rubberized ring around it for reasons I don’t quite understand. Removing the advancer reveals a super tiny eraser that won’t last long but does indeed erase. Below that is a clip, which is fit onto the barrel in a way that would allow removal, but with difficulty. Japan is stamped into the side of the clip, and the name and size of the pencil is written on the barrel just beneath the clip. The barrel is plain until one gets to the section, which is metal and extended, the bottom half is knurled, but not aggressively so; it provides a good grip. There is a small hole in the grip that allows one to see the fact that the pencils mechanism is turning (but no the mechanism itself). Down from that is a tip very similar to the regular Kuru Toga, but extended is some ways. On this model this oddly designed step down cap is still not necessary, but covers up an otherwise ugly portion. Now on to the part everybody loves, the mechanism. I mentioned that I was under-whelmed by this previously, and I still am, but I know why now. The window in the grip section allowed me to see clearly when the mechanism was turning and when it wasn’t. And while it was possible to do this in the cheaper versions I was a bit harder to see. The mechanism itself by the way, as far as I can tell, is identical in both pencils, but there is no way to open them and find out exactly without possibly rendering them inoperable. But the answer to when the mechanism was turning when I was writing with the pencil was… never. I tested it, the mechanism works, it just never moves when “I” write with it. My writing, and drawing, are much too light to get it to rotate the lead, and thus I never see the affects. The packaging (for the inexpensive one, my roulette came in all Japanese packaging) says that the mechanism helps with the point of the pencil, and to prevent breakage. I really have never had a problem with either of these things, partly because I flail the pencil around compulsively when writing and drawing, and that rotates it such that my lead is always at a point. Now I guess I know that I write far too lightly to have a problem with breakage. But man, if I write lightly, some people must really press down on the things. So yes, it works flawlessly, but if you write like I do it isn’t really a selling point. And finally I wouldn’t worry about the mechanism wearing out, it is extremely well made and there have been no complaints about such a thing occurring, so if it does by that time you’d be able to just get a new one, it’s popularity means it likely isn’t going anywhere. So, it is a good pencil? Yes. Is it worth the money for the upgraded version? Yes, even without the mechanism. 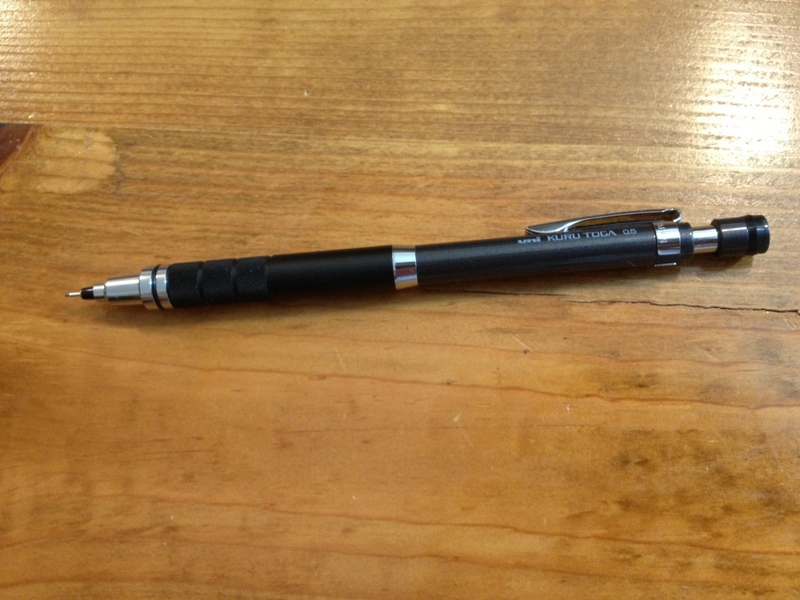 The pencil is solid, well made, and solves the comfort issues I had with the less expensive version. The weight is good, the feel is good, the metal gives one a good grip and the writing is nice and fine. And if one does press hard enough to activate the mechanism I’ve heard nothing but good things. I wouldn’t take it over my Graphgear, but that’s just personal preference. I like the thinner body a little better on that one. So if you write with a lot of pressure, the Kuru Toga is the pencil for you, if you don’t you have other equally good options within the price range in my opinion. Even then it’s definitely worth a look. This entry was posted in Beginner Supplies, Intermediate Supplies, Tools and tagged art, art supply, art supply review, kuru toga, kuru toga roulette, mechanical pencil, metal, pencil, plastic, review, roulette, uni, uni kuru toga roulette, uniball, unique, writing by Dragon Co (Austin Smith). Bookmark the permalink.